This week we're working on detailed previews for each of the sections, breaking them down into the top athletes and teams in every division. It's all part of the build-up to the first big weekend of cross country races when we'll finally have some current results to use to judge the 2018 teams! When discussing the Sac-Joaquin Section, it only makes sense to begin the conversation with the Jesuit boys program. Jesuit, with a stunning 26 overall SJS boys titles and nine CIF-State titles - tied with McFarland for the most in CA - is rebounding from a rare season where it did not win the section title. Fast forward to 2018, with one of the top juniors in the country (Matt Strangio), a top-tier transfer (Chase Gordon), and impressive depth, it appears Jesuit is poised to return to the top, at least of SJS D-I. On the girls side, so many familiar names and four of the five section champions graduated, leaving both a legacy and a void for a new crop of promising young runners to fill. 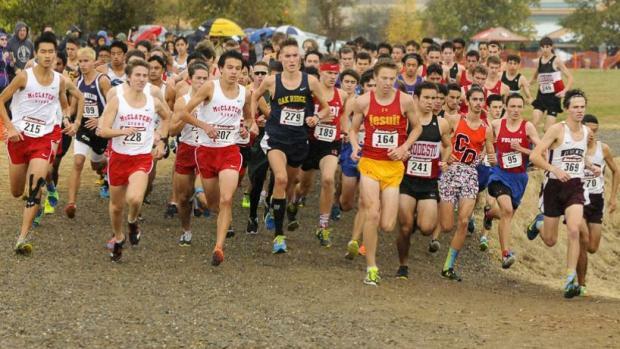 We explore each of the five divisions, looking at returning runners from last year's section finals, tapping into history of the section, and comparing how returning runner averages project how traditional powers may or may not be in line to win a title. Note that the SJS final is run over a 5K distance and that is what is used for both team and individual rankings. In cases where a team does not have at least five runners with 5K times or individuals do not have 5K times, those teams and/or individuals will not appear in the rankings. These rankings are based on 2017 results. Finally, there has been some shuffling of teams across divisions for the 2018 season. We have made every effort to reflect those changes in the database so that rankings are accurate for projecting the current season. All photos by James Leash. NOTE: The girls preview section was been updated (9/25) to correct Woodcreek as a D-II team.